In the eighteen years I have been a teaching artist in schools, I have seen over three thousand students from grades K-12. In the art studio, I facilitate learning experiences which expose students to formal elements and principles of art while pushing students to think critically about themselves in the world. The curriculum I create is guided by art standards and pedagogical questions driving different school cultures. My curriculum is also created collaboratively and aligned to Common Core and Next Generation Science Standards. Below are examples of themes explored with students over the years. 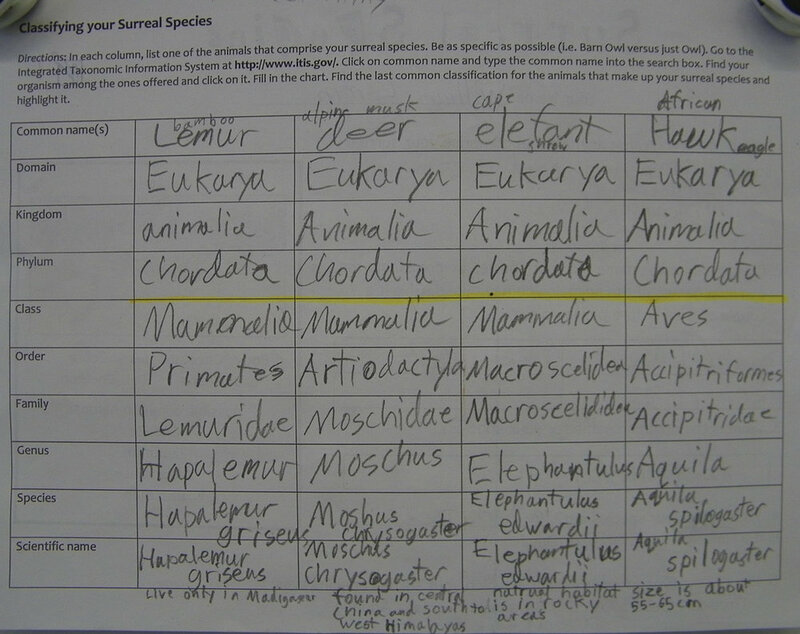 A majority of this work was completed with students grade 6-8. 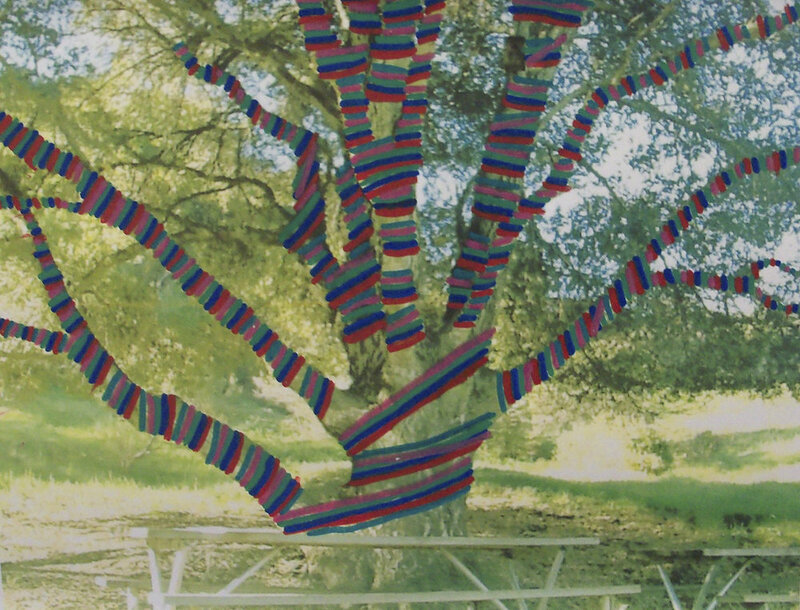 Students looked at artists whose work brings attention to and amplifies a connection to the natural environment. They explored a favorite place on their campus and created proposals to bring attention to their spot. Students spent time recording sounds they heard when sitting in one spot for a duration of time. Alongside guest artist Jen Karson, students mapped the sounds, creating score-like drawings of their moments of observations. Before an annual class trip to Yosemite, students looked at the work of Ansel Adams and 20th century Black and White nature photography. 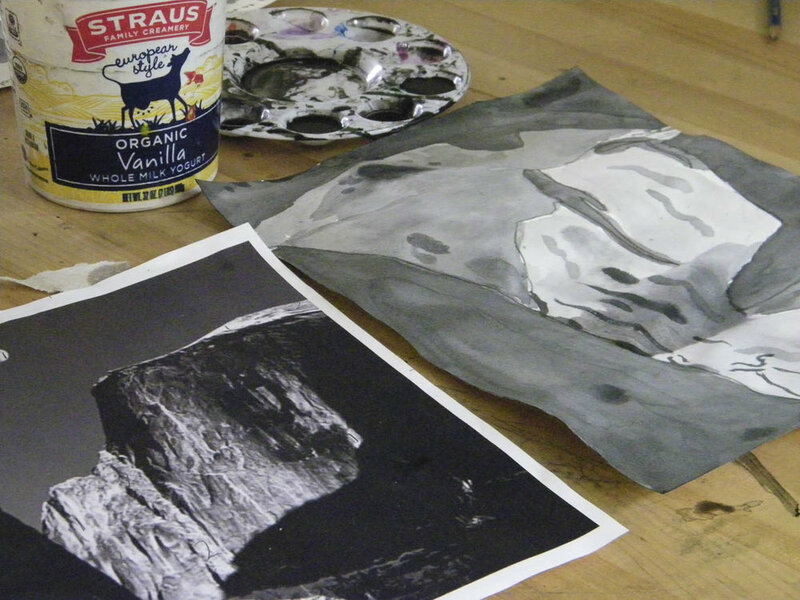 Students recreated images to learn about grayscale. Before taking a backpacking trip to Joshua Tree National Park as part of their natural history unit, students were assigned an animal inhabitant to study in depth. Combined with a woodblock carving unit in art class they created their own relief prints of their animal. Phil McCracken is an artist deeply connected to the natural world around his studio in the Puget Sound. Students created their own totems based on animals that they had seen in their own backyards. Students were often asked to draw from nature, observing the inherent patterns, lines and shapes to be found around them everyday. Keith Haring was a catalyst for students to explore silkscreening, flat graphic lines, layered color, symbols and shapes. After a walk around the neighborhood, students created sgraffito style thumbnail sketches of patterns found. Students used shapes and color to describe family members and their relationship to each other. They assembled the individual pieces with attention to shape and form, learning how to score and slip while they built their ceramic forms. This was prompted by efforts to understand how a non-figurative sculpture can have meaning to the maker. Students are full of questions. We looked at the work of Lynda Barry and the beauty of hypothetical questions. Each student came up with a list of questions that love to think about and focused on composition to illustrate it. 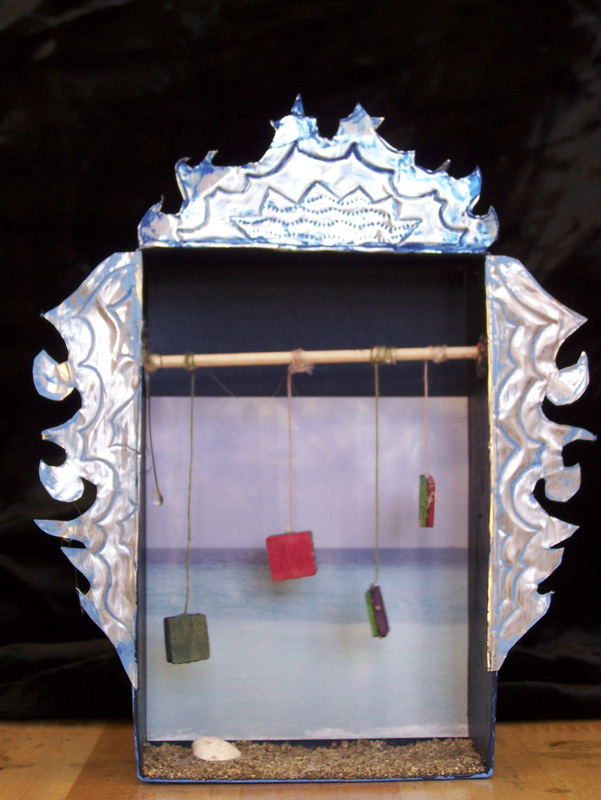 After a visit to see a Joseph Cornell exhibit at the SFMOMA, students explored assemblage techniques. They searched through pieces of recycled junk to find objects that spoke to them individually to create a visual narrative within a box. Students went to an exhibit of Bay Area graffiti artists, including Margaret Kilgallen. After discussing the importance of an individual's hand in their line work, students created visual responses to a series of prompts. They chose their favorites that most described them and clustered them together for display. Students brought in an object from home that held great value to them. These identity objects became the focus of a drawing exercise. Kids reflected that it had even more value after taking the time to really look slowly at their objects. Students were challenged to create a self portrait bust. They learned how to use paper armatures to support clay work over time, using an additive technique to add details. When students were learning about how the brain responds to stress in an SEL unit, we created collographs, highlighting zones considered most active when students engaged in their favorite activities. As students were learning about the scientific method in science class, we conducted our own ink experiments We discussed traditional ways of making permanent ink as well as the challenges of obtaining consistency. Students read the book Ok For Now in English class, which focused on a boy who used John James Audubon's prints as a metaphor for what is going on in his life. In art class students looked at his bird prints and created their own watercolor renderings. After learning about some of the games of the Surrealists such as Exquisite Corpse and free-writing, students created a Surreal Species collage. They created a name for their species, as well as found where their species diverged from traditional taxonomies. 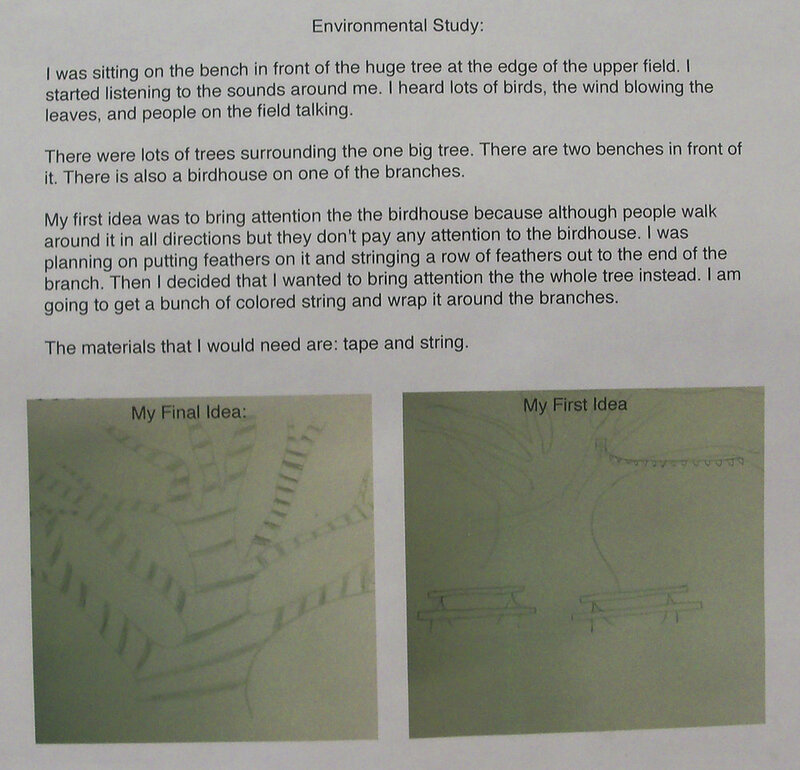 As an introduction to biomimicry, students looked at many inventions that were inspired by nature. They then came up with their own inventions based on chosen natural features. Students traditionally do a physics unit in which they learn about simple machines. After looking at the Do Nothing machine by Ray and Charles Eames, they tried their hand at their own simple machines. Carmen Lomas-Garza is well known for her paintings depicting everyday Chicano life. Students pulled from memories of their own family traditions to create personally relevant paintings. While exploring tints, tones and shades of color, students looked at the work of Kelly Ording, an artist influenced by traditional Chinese brush painting. Students were challenged to create fantastical landscapes and we spent time looking at how one can use compositional elements to move eyes around a painting. Students looked at how artists use maps to explore relationships and tell stories of identity, conflict and reveal networks. Students chose concepts of their own to map into landscapes that tell stories. After reading two graphic novels that deal with biography and memory (Persepolis and American Born Chinese), students reflected on distinct memories from their past to try their hand at short comic stories. After looking at the examples of Tuareg animal sculptures, students worked on their own versions of miniature fabric wrapped animals with wire armatures. Students sculpted and painted fantastical paper-maché creatures based on the tradition of Oaxacan-Mexican alebrijes. beginning with a basic pinch pot, students created small ceramic figures inspired by a study of Mexican Tonala animal figures. As a collaboration with guest puppeteer Leonidas Kassapides students created stories of travel, history, fairytales and modern love. They performed their plays for an assembly of middle schoolers. Students worked on stop-motion animation using iPads and iStopMotion software. Students get insight into the world of computer programming, using Scratch programming to create animations and video games. Bringing technology into the classroom is not just about playing on a computer, it is about using it as a tool to support the enduring understandings. Students create presentations about their new classmates to share later with the whole class. This video was made by a small group of 7th graders exploring stop-motion animation. Students learned their their own faces could be used as armatures and worked with plaster strips to create masks. During an art intensive, students gained exposure to many materials, including an introduction to welding. 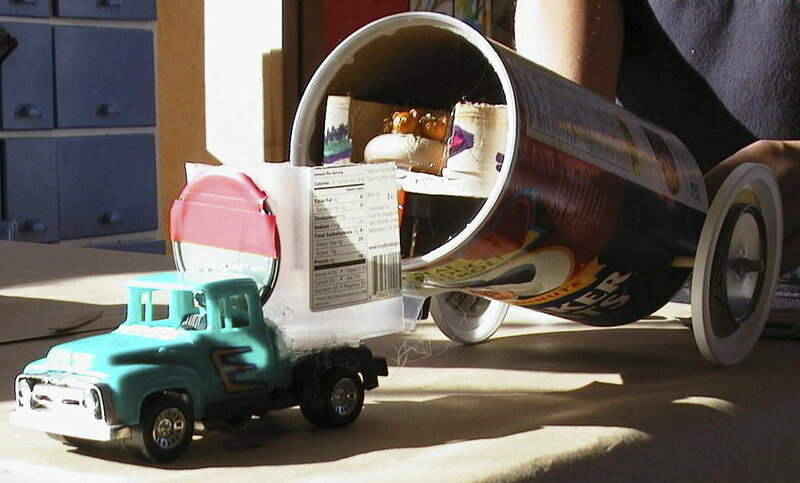 Students learned the benefits of other people's trash, finding the materials for this project from recycle bins at home, at school and scrap yards to repurpose for use in the classroom. Students explored silkscreening as a pop culture alternative to traditional etching and relief printing. Making a connection at a local dark room, students in the art intensive gained an introduction to this classic art form. Students explored textures of many materials, gluing plastic, string and cardboard shapes on a backing to print collographs. Students had no fear in taking apart small machines that were used as a starting point for a contour drawings and recycled parts sculptures. After taking apart machines to find out what was inside, students used the images as a basis for a contour line drawing exercise. As their peers posed, students practiced getting an overall sense of the figure. Although never an easy thing in middle school, students spent a long time looking at the proportion of features on their face to complete self-portraits. Drawing is an important part of students learning how to make deep observations of objects they see everyday. Students practiced one-point and two-point perspective with projects such as drawing their room or a building. Always encouraged to mix their own colors versus anything right out of tube, students began to understand relationships of complimentary and analogous colors, mixing paint to make their own color wheel. Students mix tints, tones and shades of different colors to see the multitude of options available to them. Taking the time to stop and look, while record information and details from their observation is a skill incorporated into every lesson. 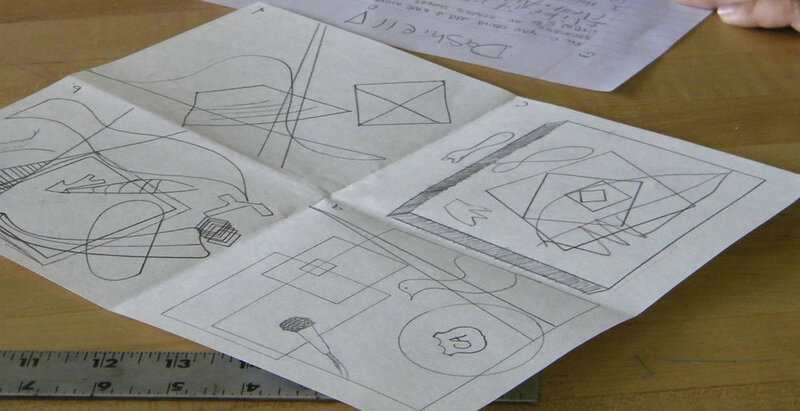 Students practice composition ideas with thumbnails which help them work through their ideas before the final painting. 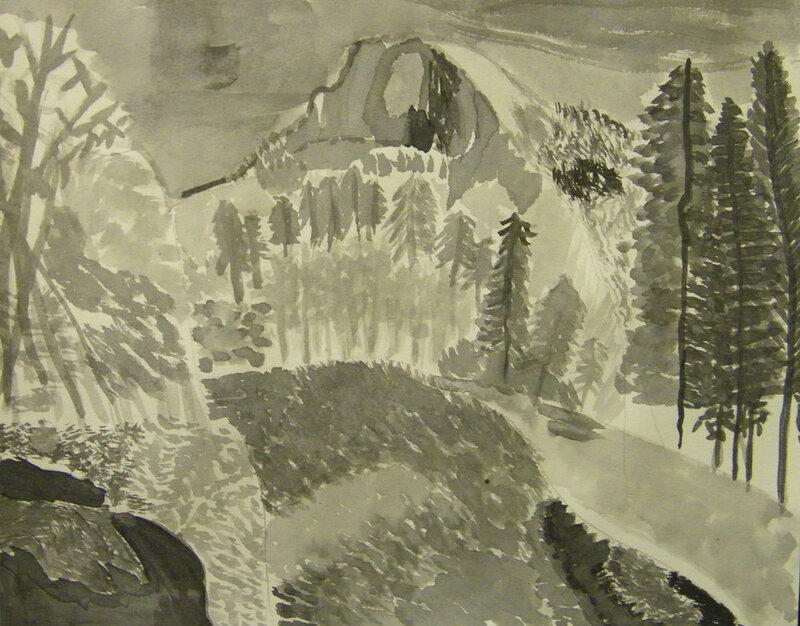 Students learn how value plays a role in atmospheric perspective with washes of India Ink. Students looked at the work of Jacob Lawrence and Romare Bearden during the Harlem Renaissance. They depicted scenes from their own lives out of collage. Student chose their favorite music to listen to as they created pastel music compositions inspired by Vassily Kandinsky. While learning about Ancient Greece, students chose different vase styles to paint and decorate as red or black figure vases, depicting themselves involved in their favorite pastime. Pop art was one of the student's favorite are movements to study as brought humor and primary colors into their work. After looking at the work of Georgio Morandi, students practiced drawing cylindrical shapes in oil pastel, focusing on the relationship between objects to create their composition. After learning about Abstract Expressionism, and in particular the work of Alexej Jawelensky, students created self-portraits and practiced creating their own color palettes. While spring brought out blooms all over the neighborhood, students brought the color inside inspired by Georgia O' Keefe to paint large scale images of flowers. While practicing their additive sculptural techniques, students chose objects from around the classroom to recreate out of clay. Students engaged with the theme of re-contextualized historical events after becoming familiar with the artist Kota Ezawa, reconstructing important events in their own lives.